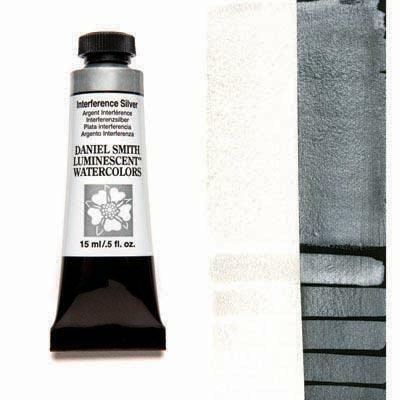 Interference Silver shines with an icy veil of transparent silver when glazed over dark colors or painted directly onto black paper, and when painted on white paper, Interference pigments display a subtle sheen. Interference Watercolors, part of the DANIEL SMITH Luminescent Watercolors collection, refract light, causing light to scatter. Why choose Luminescent Watercolors? Because Nature has optical surprises in the colors that you see in birds’ feathers, insects, fish, and seashells, many flowers also have a pearly, dewy sheen to them. Consider the iridescence of a snail’s trail or a silvery spider’s web. Other things that also have a sparkle, or glow depending on the light, a silvery or golden moon, clouds aglow at sunset, rainbows, the sparkle of snow and ice, and glint of water reflections. Don’t forget the sheen of metals like pewter, copper, silver, and gold. There are also mythic subjects that are often thought of as having a special iridescence to them such as fairies, dragons, mermaids and other fantasy figures. DANIEL SMITH Luminescent Watercolors add that touch of special color found in nature that regular colors cannot match. They’re made from mica pigment, thin transparent particles coated with highly reflective metal oxides. Luminescent Watercolors show best as glazes over darker colors and are excellent mixed with other colors adding a bit of their luminescent glow.